Abel Rodriguez gets back on his feet after hip replacement surgery. 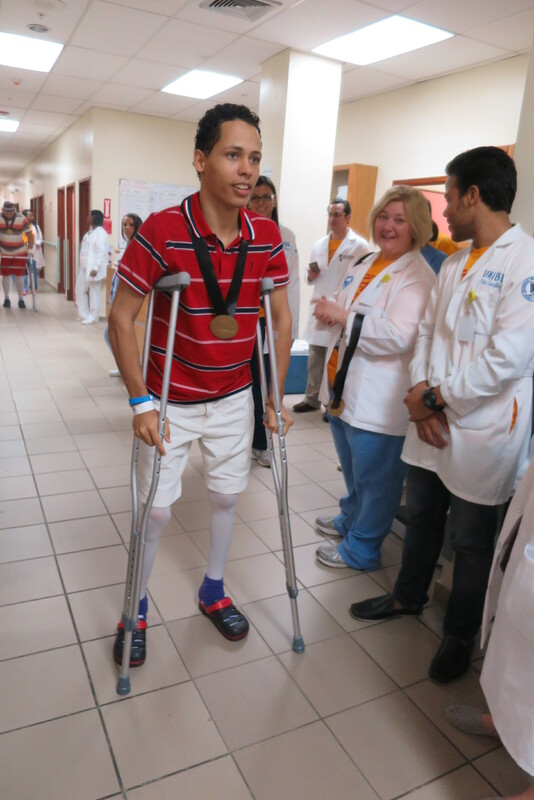 For five years following a traumatic injury, 20-year-old Abel Rodriguez, of the Dominican Republic, experienced excruciating pain in both of his hips, forcing him to walk hunched over with crutches. Xiomara Concepcion, a 34-year-old woman suffering from rheumatoid arthritis and bilateral knee pain since adolescence, required a wheelchair to get around. Rodriguez and Concepcion are among 39 patients whose lives were transformed last month when they received joint replacements, thanks to Operation Walk Boston. For one week in March, a team of more than 50 volunteers, including surgeons, anesthesiologists, nurses, physical therapists and operating room staff traveled to the Hospital General de La Plaza de la Salud in Santa Domingo for Operation Walk Boston’s eighth mission. The BWH-led team performed 56 knee and hip replacements. Additionally, 58 volunteer medical students from the Dominican Republic cared for patients as part of the team’s goal of educating the next generation of health care professionals in the country. Read the story in BWH Bulletin and visit Operation Walk Boston for more information.